This modern version of Barbour’s celebrated International biker jacket updates the classic look with a youthful slim fit. The iconic Barbour International A7 jacket was created in 1936, and became the biker jacket of choice through the 50s, 60s and 70s. 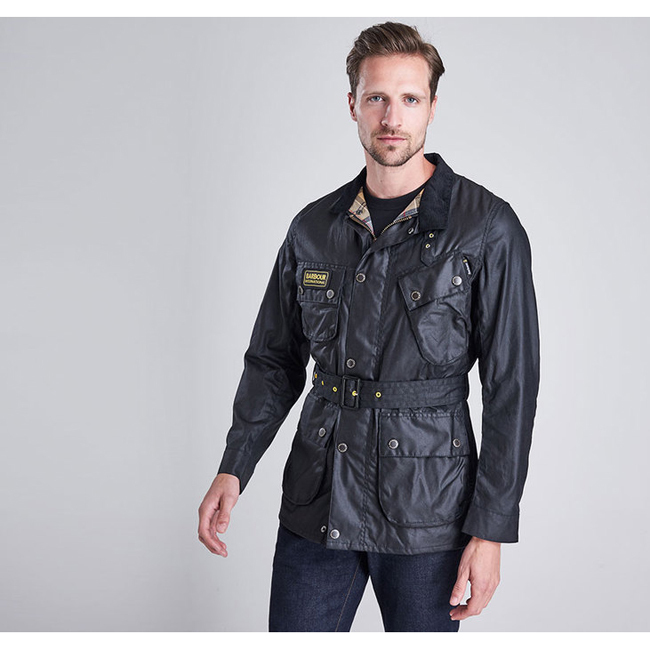 Retaining the robust functionality of the original, this modern edition features a Sylkoil waxed cotton outer, a front zip with stud-close storm fly and a durable cotton Barbour Tartan lining. Signature styling includes the funnel collar with buckle-fastening throat strap, a waist belt and four outer pockets – one of which is the biker’s angled ‘map pocket’, originally designed to give easy access while riding. Outer branding celebrates Barbour International’s famous black and yellow colour palette with two-tone studs, yellow eyelets and a bold sleeve badge.